Transcript from interview with Jennifer Warren, M.D. It's time to start moving! We chatted with bariatric physician Jennifer Warren, M.D., medical director of Physicians Healthy Weight Center, about how to set realistic goals and the best way to maintain a healthy body and attitude as we start towards those goals. Welcome to WebMD University: "4 weeks to Fitness." Your instructor today is bariatric physician Jennifer Warren, M.D, medical director of the Physicians Healthy Weight Center. She joins us to discuss starting a fitness program. Welcome to Web MD University, Dr. Warren. Thank you for joining us. Please tell us a little bit about your background. Thank you. I experienced obesity firsthand for many years, and used to weigh close to 200 pounds. As a Family Medicine physician, I also saw many of my patients struggle with their weight, and with medical problems associated with excess weight. I began to study Bariatric Medicine, also known as medical weight management, for my own health, as well as the health of my patients. After studying nutrition, exercise, lifestyle, and medical aspects of weight management, I now keep my own weight below 140 pounds. I am a Diplomate of the American Board of Family Medicine, and after successfully completing written and oral examinations, and a full review of my program, I have achieved certification by the American Board of Bariatric Medicine. 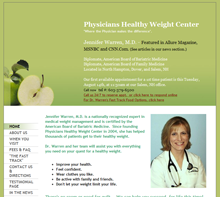 I founded Physicians Healthy Weight Center in 2004, in North Hampton, New Hampshire, and I now focus my practice full time on healthy weight management, exercise, nutrition and healthy lifestyle. I counsel patients on developing healthy eating patterns and exercise routines so that they can achieve a healthy weight and lifestyle and prevent other health problems. In your work at PHWC, you work with patients who have a wide variety of fitness goals. What is the most common fitness goal that you see? The most common goal is to develop a fitness plan that will fit into regular daily lifestyle and achieve maximum health without spending too much time, actually. A lot of people are sedentary when they first see me and don't know how to begin a program. We counsel them to start gradually and build up slowly. The most important thing is to make exercise a regular habit. We also warn people to expect to have interruptions due to illness, and to forgive themselves for being less than perfect, and get right back on track as soon as they're able. How does regular exercise impact a weight loss program? Regular exercise appears to be necessary for weight maintenance in the vast majority of people, once they reach their weight goal. Exercise also speeds weight loss during the active weight loss phase of a program. Some programs advise people to avoid exercise until after they've lost weight. I find people are much more successful if they incorporate exercise right from the beginning, and make it part of their routine. Exercise allows people to preserve muscle while they're losing fat tissue, increases their sense of well-being and energy level, and makes it easier to lose weight. "The most important thing is to make exercise a regular habit". I advise people, if they are currently sedentary, to start with 10 minutes per day of moderate activity- like walking, dancing, or using a stationary bike. And after several weeks, they can increase the amount of time. It's important not to be too aggressive at the beginning because that tends to discourage people, and increases the risk of injury. It's far more important to do a little bit of exercise more frequently. I emphasize starting with aerobic or cardiac activity, and after two to four weeks, adding strengthening exercises. Generally I recommend two to three times per week of resistance or strength exercise and this will accelerate weight loss, as well as give other health benefits. Some people like to exercise by themselves, others prefer a workout partner for encouragement, or they may choose to go to a gym or work with a personal trainer. I personally do most of my workouts at home using either exercise videos, treadmill, or a stationery bike. Many busy people don't get to go to the gym regularly, and home exercise can be just as effective for some people. How does regular exercise affect our state of mind? Some recent studies have suggested that regular exercise may be as effective for depression as antidepressant medication. Exercise also gives people a sense of accomplishment and control over their lives. People are able to participate in activities more easily with family and friends and often become more social, which further helps their state of mind. With former athletes who have become sedentary, I warn them to not be too hard on themselves when restarting an exercise program. They often become discouraged at first, but I assure them they will soon regain their strength and ability, and feel much better about themselves. For people who have been sedentary their entire lives, I often find they don't view themselves as people who can become regular exercisers, and are embarrassed to begin exercise programs. I encourage these people to begin on their own or with one partner, and have found over several months they completely change their attitude about exercise. They try new activities they were afraid to try previously. Their attitude, obviously, changes remarkably and becomes more positive when this happens. Many obese people are worried about safety when beginning a fitness program. What advice do you have for these people? If someone is over age 40 or extremely unfit, they should certainly check with their primary care provider before starting an exercise program. I advise people to start very gradually and to pay attention to any joint pain, chest pain or pressure, shortness of breath, nausea, or extreme fatigue, and to stop exercising immediately if these occur and to seek advice from their doctor. "Almost anyone can incorporate some type of exercise into their lives." Most people are able to walk for at least five minutes, and if they feel a little muscle soreness, this is to be expected if they have been completely sedentary. The goal is to get to ten minutes of continuous exercise to the point that the patient is somewhat short of breath but still able to have a conversation. It only takes a few weeks before endurance increases, and people usually will be able to move up to 15 minutes per day. Some people achieve this very quickly; other people may take longer. The ultimate goal is to ideally build up to 30 minutes, for five to seven days a week of cardiovascular exercise, and then to incorporate the strength exercises two to three times per week. People who are new to strength exercise may want to work initially with a personal trainer, or physical therapist if they have physical limitations. Some people are able to add strength training on their own using a book or a video. They must look in the mirror to make sure their form is correct if they go this route. One excellent series of books: the "Strong Women" books by Miriam Nelson. She gives excellent advice on starting a strength-training program. How can those with limited financial resources practice a daily fitness regime if they can't afford to join a gym? Again, as I said previously, a complete exercise program can be done at home. I live in New Hampshire, so it is difficult to exercise outdoors year round. But people often are able to purchase a relatively inexpensive exercise bike or may use an exercise video for their cardiovascular training and may use a book or video to add strength training. One video resource I often recommend to patients is the website called collagevideo.com. You can type in your fitness level and areas of interest and they will recommend videos appropriate for your level. What about personal trainers? Are they really helpful? Personal trainers are definitely helpful for some people. If people have injuries they may prefer to start with a physical therapist, but if they have no physical limitations and are trying to learn good technique and have a cheerleader, personal trainers can be extremely helpful. I recommend asking local gyms for recommendations, and speaking to several clients to get a feel for an individual trainer's style. Some trainers are definitely more aggressive than others, and I occasionally have a patient who worked with a trainer who was too aggressive for that individual and they become discouraged early on. It's important to work with a trainer you are comfortable with. Also ask what education and training they have had. So many people are fired up with starting a fitness program, but their motivation quickly wanes. How can we help ourselves succeed over the long haul? Great question. The most important thing to keep in mind is to find an exercise that is enjoyable and convenient, that fits into your lifestyle. Some people tell themselves they'll go to the gym seven days a week, and this often is not realistic. If people are very busy, I advise them to find a routine they can do at home, and they may want to supplement this by going to the gym two or three days a week. I also advise them to make exercise a "non-negotiable" priority and to try to do at least 10 minutes per day, no matter what their circumstances, unless they are sick in bed. "..find an exercise that is enjoyable and convenient, that fits into your lifestyle." Often people are too hard on themselves, and if they are unable to exercise for a half hour or full hour, they decide to do nothing at all. This is a counterproductive attitude, and I advise them to try to do at least 10 minutes. If they are bored with their current exercise, walking, for example, they can look into other activities, like dancing, kickboxing, swimming, an exercise class, or a new sport, such as kayaking. I personally avoid boredom by having a large number of exercise videos of different types, and rotate them regularly. Many people find having an exercise partner or buddy helps to keep them motivated. Walking and talking can be a nice social outlet, as well. Others find that classes give camaraderie and encouragement, and this helps them keep on track. It also helps to remind yourself of all the benefits you're getting from exercise: improving the quality of your life, extending your life, and enjoying your life more. Focusing on these benefits can keep you going. Often weight loss will plateau after a while. How can we use exercise to jump off the plateau to start losing again? There is something called FITT Principle to break through plateaus. Basically what this means is that you can change the Frequency, Intensity, Time or Type of exercise, and fat loss will pick up again. Using new muscles, or using muscles in different ways, can increase your calorie burn. Sometimes increasing intensity or adding intervals of higher intensity will increase metabolism and speed people through plateaus. If people are walking for their cardiac exercise, sometimes adding one minute periods of speed walking several times throughout their session will make an amazing difference for weight loss. It's also helpful to look at food consumption when facing a plateau - and journaling and counting calories will sometimes uncover excess intake when you didn't realize it. You may also discover you're eating inadequate amounts of protein or carbohydrate, and nutrition deficiencies will limit the benefit from exercise. I am 48 years old and I like walking. It fits into my daily schedule, but I'm concerned that it's not "enough". How important is it that I lift weights to avoid the effects of menopause? Recent studies have shown that adding weight training or strength training is extremely helpful when approaching menopause to avoid weight gain. "Exercise gives people a sense of accomplishment and control over their lives." WebMD reported on March 3, 2006, that lifting weights twice per week helps women at middle age keep fat at bay. This was the Strong, Healthy and Empowered (SHE) study. It demonstrated that weight training limited fat gain in the abdomen. Dr. Miriam Nelson's books, the Strong Women series, also note that strength training actually makes your cardiovascular training more effective. Strength training gives other benefits as well, including improving bone density. And many strength training routines also improve balance, which can protect you from falls and injury. In addition to these benefits, every extra pound of muscle you add through strength training means you're burning additional calories, even at rest. You may burn anywhere from 30-100 extra calories per day by adding a pound of lean muscle. This makes weight control easier. Plus, many women report a sense of well being after strength training, and incidentally, like the way their clothes fit after increasing strength training. Is spot reduction a myth or is it really possible to focus exercise in order to eliminate a tummy bulge or flabby upper arms? Great question. I hear this all the time. Spot reduction in the traditional sense is a myth. However strength training in certain regions of our body, such as triceps or abdominal work, can tighten the muscles in those areas and make those areas appear smaller. Proper diet and cardiovascular exercise can also improve your body's insulin sensitivity and this may result in more weight loss in the abdominal area. A balanced diet including protein at every meal, and snacking on higher-fiber carbohydrates (including whole grains, fruits and vegetables), and moderate amounts of omega-3 fats and monounsaturated fats (such as fish oil, olive oil, nuts, and avocado), can improve insulin sensitivity and can aid in abdominal weight loss. Simply cutting calories without paying attention to the quality of those calories is not as healthy or helpful. Central weight gain (in the abdominal area) or a high waist-to-hip ratio is a more dangerous pattern of fat accumulation and is associated with higher cardiovascular and diabetes risk and a syndrome known as metabolic syndrome. Bariatric physicians refer to this as the "apple" pattern of weight gain (as opposed to the "pear" pattern.) Women should aim for a waist-to-hip ratio of less than 0.8, and men less than 1.0. Right now, I exercise three times a week for 45 minutes. One day I'll do 45 minutes of cardio and the other two days I do 30 minutes of cardio and 15 minutes of weights. On the days I do weights, one day I'll do upper body and the next day I'll do lower body. Is this OK or should I be trying to strength-train all muscle groups on the same day? For minimal cardiovascular health, people should try to do their cardiovascular exercise three days a week, but optimally get up to five days a week. Total body strength training can be done all at one time or may be spread out over several days. The important thing to keep in mind is that you need at least a full day off before strength-training a particular muscle group again. You can, for example, work on arms, leg strength, and core strength all at one time, and take a day off before doing it again. Or you may choose to alternate: work arms and abs on Monday and Wednesday, for example, and legs on Tuesday and Thursday. "Find something you enjoy doing and don't give up." In general, strength training is commonly done with 12 repetitions per set, building up to two sets per session, with a one-minute rest between sets. The weights should be heavy enough so that by the 12th repetition you feel as if you could not do one more. If you feel this way by the 6th repetition, the weight is too heavy. And if you're able to get repetition 12 without any fatigue, the weight is too light to have much effect. How do elliptical trainers work? Are these machines a good investment? Elliptical trainers can be an excellent cardiovascular exercise for some people with joint problems, but I strongly advise people to try a machine before purchasing. I personally have short legs and find elliptical trainers uncomfortable to use, but many of my patients enjoy these very much and feel the investment is worth it. I generally advise patients to vary their types of cardiovascular exercise to avoid boredom and overuse injury. For example, they may alternate walking outdoors, with an elliptical machine, and a stationary bike, and have additional dance classes. The variation can protect joints and help you avoid boredom, as well as maximize calorie burning. We are almost out of time, Dr. Warren. Do you have any final comments for us today? Doctors often call exercise the magic pill, and it is true that exercise can prevent or reverse many common medical problems, including diabetes, hypertension, cardiovascular disease, possibly Alzheimer's, and many cancers. I think the most important message is that almost anyone can incorporate some type of exercise into their lives, and people should not be intimidated by starting a program. Many people have started exercise in the past, and have gotten off-track. I tell people not to be hard on themselves about this, and that it is never too late to start again. We can benefit from exercise well into our most senior years both physically and mentally. Find something you enjoy doing and don't give up.